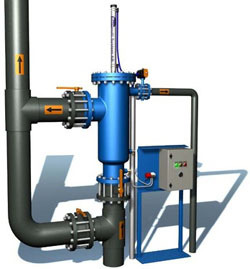 Self-cleaning Bernoulli Filters protect Plate Heat Exchangers in virtually any application, especially where raw cooling water is used. Advanced, simple Swedish technology is highly reliable yet demands minimal maintenance. By cooling with untreated water (including seawater), users realize substantial, continuing savings. Yet Bernoulli Filters drastically curtail PHE fouling. The results: minimal cleanup, protection from heat exchanger damage, long system life and reliable operation day in and day out.